Protein adsorption onto calcium phosphate (Ca–P) bioceramics utilised in hard tissue implant applications has been highlighted as one of the key events that influences the subsequent biological response, in vivo. 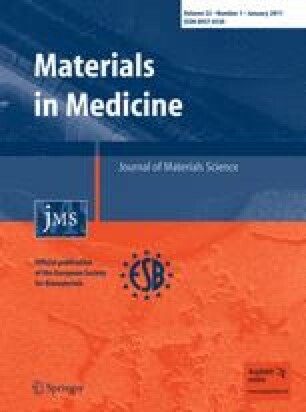 This work reports on the use of surface-matrix assisted laser desorption ionisation mass spectrometry (Surface-MALDI-MS) as a technique for the direct detection of foetal bovine serum (FBS) proteins adsorbed to hybrid calcium phosphate/titanium dioxide surfaces produced by a novel radio frequency (RF) magnetron sputtering method incorporating in situ annealing between 500°C and 700°C during deposition. XRD and XPS analysis indicated that the coatings produced at 700°C were hybrid in nature, with the presence of Ca–P and titanium dioxide clearly observed in the outer surface layer. In addition to this, the Ca/P ratio was seen to increase with increasing annealing temperature, with values of between 2.0 and 2.26 obtained for the 700°C samples. After exposure to FBS solution, surface-MALDI-MS indicated that there were significant differences in the protein patterns as shown by unique peaks detected at masses below 23.1 kDa for the different surfaces. These adsorbates were assigned to a combination of growth factors and lipoproteins present in serum. From the data obtained here it is evident that surface-MALDI-MS has significant utility as a tool for studying the dynamic nature of protein adsorption onto the surfaces of bioceramic coatings, which most likely plays a significant role in subsequent bioactivity of the materials. This work was kindly supported by a RTD Networking grant from Invest Northern Ireland (RTD 375). This work was part of the Centre for Nanostructured Polymer Surfaces for Medical Applications, funded by the Danish Ministry for Science, Technology and Innovation (2002-603-4001-87). The authors would also like to thank Kratos Analytical (UK) for their assistance with the XPS analysis.